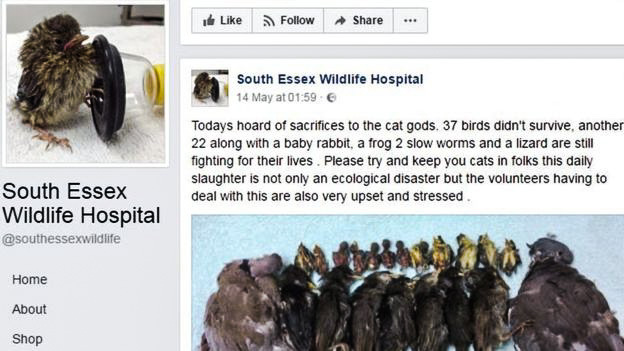 The South Essex Wildlife Hospital have presented, online, a grisly photograph of birds killed, it is implied, by domestic cats. The photograph is published on this page. What they say, and the photograph that they have published, has sparked off, yet again, that intractable and unsolvable debate about (a) how much wildlife (particularly birds) domestic cats injure and kill and (b) whether cat owners who let their cats go outside are being irresponsible. Are they directly responsible for these deaths? A spokesperson at the hospial states that they treat up to 60 animals a day, mainly birds, and that they have all been attacked by cats of which 50% are injured and then left to die. We are not told how they have assessed that the injuries to the birds have been caused by domestic cats. The hospital spokesperson has said that cats should be kept inside or kept on a leash or within the confines of an enclosure. Dramatically they describe the deaths of 37 birds in one day as a “horde of sacrifices to the cat gods”. The workers at the hospital are upset. They say that native wildlife in the UK has not evolved to deal with the hunting of the domestic cat. I disagree with that. UK wildlife has to deal with many predators other than domestic cats and they have evolved to avoid those predators if possible. The fact of the matter is that in the UK nearly everybody lets their cat go outside to roam freely. Nothing will change this as it is deeply embedded in the British way of life unless the government legislates against it which will never happen. I agree that cat owners should be responsible towards neighbours and towards the environment but, at the end of the day, when a cat kills a bird nature is being acted out. Is it right to stop nature taking place? People have entirely opposing views on that. Human activity in the UK has a greater impact upon bird populations than domestic cats. I am thinking of farming and pesticides. There are other individual cases of birds being killed such as a record number of birds illegally killed on a British military base in Cyprus. They were hunted during migration. I’m sure that most cat owners do not like to see birds being killed by their cats. But they don’t see a solution. And they are resistant to keeping their cats indoors. Sir David Attenborough has warned that cats kill a huge number of birds. He has suggested that cats should wear collars with a bell to stop them killing robins. Some people cannot understand how cat lovers allow their cats to kill birds. Cat lovers should be animal lovers and therefore they should be upset when their cat kills birds. I think probably that cat owners are upset but the problem is that humans in general are never so upset about the death of an animal that they are prepared to do something about it. They are not prepared to change their ways. And that applies to their cat being killed on the road. Perhaps the answer is a compromise. Cat owners should restrict their cat’s access to the outdoors at dawn and at dusk when wildlife is at its most active. The collar with a bell idea may also be a decent one. But how many cat owners do this or will do it voluntarily? Try and keep a cat inside at dawn and dusk and he’ll make your life miserable. You’ll struggle to satisfy his urge to hunt with play at 4am. I would really love to see this problem resolved. To be honest nothing changes. I do believe though that predation on birds by domestic cats is exaggerated. In addition, the RSPB have stated that the domestic cat is not a threat to bird populations. We have to be careful. There’s too much speculation. I think that this hospital is being slightly irresponsible and exaggerating the matter but I’m sure that there are millions of people who will disagree with me. The well-known troll called Woody is forbidden from making a comment on this page for the good reason that he cannot resist insulting people and his input is always exactly the same so we know his point of view already. This entry was posted in hunting birds and tagged birds, cat behavior, cat crepuscular activity, cat hunting, cat preying on birds, cats killing birds, hunting birds by Michael Broad. Bookmark the permalink. Yes I agree with the compromise. I’ve had indoor/outdoor cats for 25 years and it’s easy to be disciplined enough to keep your cats in at and after dusk and dawn. Also to feed them before letting them out and keeping an eye on them. I’ve experimented with my cats, exploring their behavior and am very humane and practical. In the beginning I was working and didn’t spend a lot of time with them, and found that they do get bored too, so doing that makes a difference too. They are like kids in a way that if you ignore them, they can feel neglected and resentful and take it out on each other and by chasing birds too. If you don’t let them get good at it either, that helps. Like us, they have a sense of self and enjoy doing things they’re good at, so just let them be good at following you around, chasing a twig or string, and being cuddled and petted. I once knew a lady who worked for a UK wildlife rescue. She told me that through spring and early summer, the general public are a huge menace to birds. It seems that despite years of info’ sharing, the pubic insist on bringing newly fledged, juvenile wild birds in, mistaking them for injured birds as they hop about, haplessly bashing into things as they find their legs. A daily haul of 20 newly fledged birds was not unusual. Just to add what I rarely or never hear on this: birds actually do attack each other too; and some fight to the death. I see it often. I already do keep my cats in at dawn and dusk, and I keep them well fed. I’m home all the time and so I know they don’t get any birds to speak of. I’ve only seen it happen a few times in the past 20 years. I don’t like it either and I’ve done what I can in that regard. It’s sad and unnecessary from our perspective, but it’s not the end of the world. If I thought my cats killed a lot of birds, even one a day, I would do more to avoid that, but it’s not the case. I also believe that the kills are exaggerated and all are attributed to cats only. Wildlife conservation is noble and necessary, and I’d like to see some calories burned toward all animals, not just birds. 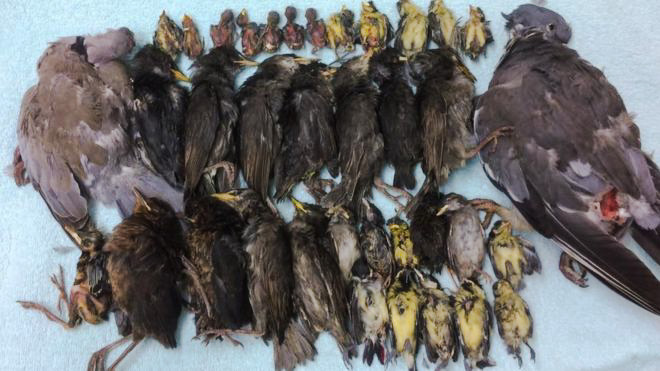 I’ve asked many vets and hospitals how many birds are brought to them and it’s about what I’ve observed… next to none, so I’m curious about the evidence in this article, and the conclusion that it’s one day’s kill (from what area(s)), how many cats. It’s a grizzly photo for sure, but in all honesty, I don’t see any especially endangered types either. They’re common. Their lives matter but there’s no song birds or anything exotic. Just saying. The UK was home to the Scottish Wildcat and European Pine Marten long before domestic cats arrived. These were also efficient predators (as are otters, stoats and weasels). Many of these native predators have been almost exterminated by gamekeepers over the centuries and their niches are being filled by domestic cats. If domestic cats were confined, native predators would continue the slaughter along with introduced mink.